Thank you, Blogadda! Had a lovely time writing for the prompt! Thank you for inspiring me to continue writing with all the interesting prompts! Thank you @shilpashu8 and @ishaspire for participation. We loved reading your posts! 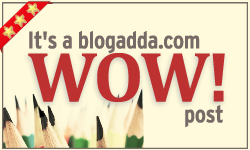 Thank you so much BlogAdda. It is lovely writing with you. Would like to know one thing- how and when do we know that the results are announced? Hi @undauntedgirl. Thank you for your kind words. The results are announced on the following Monday/Tuesday at the forum. You can have a look at the discussion board here. Can you please help me with the results of the W.O.W- Start with the lyrics of your favorite song? Not able to find it.